As students approach the second half of the school year, most are buried in homework and not necessarily thinking about their financial aid for the next year. This might cause some to miss out on funding to go to school. The free application for federal student aid (FAFSA) deadlines can be confusing to some students and applying can be a labyrinth of requirements and documents that makes you want to pull out your hair or toss your computer. It’s no wonder that many students make the mistake of waiting until right before the FAFSA deadline to start the daunting task. The best advice is to stay on top of it to avoid any trouble with your application. Student, Annissa Fitch, has her application half finished and hopes to turn it in soon, “I feel like right now it could potentially be a horror story because I am putting it off so if I keep prioritizing my school work and my employment here on campus first then that could possibly happen.” stated Fitch. “March 2nd is a priority deadline, so you don’t necessarily have to make sure the application is completed by then, but it is more likely that you will be eligible for different kinds of grants if you were to get it in before that day,” said Elliott Guerrero, who is a student peer counselor at the Office of Financial Aid & Scholarships. The financial aid office is located in University Hall and the attendants there are prepared to answer any questions that you might have during the filing period. There are four types of financial aid programs available: grants, loans, scholarships, and work study. The money can be awarded as achievement-based aid, like scholarships, or need-based aid, which is determined by financial need. According to the CSUSB website, financial aid will come in the form of a package consisting of a combination of the different types of aid available. The combination of aid offered depends on the availability of funds, your eligibility, the timeliness with which the application process is completed, and your year in school. Once your FAFSA is complete, you will be sent a financial aid shopping sheet that can be viewed by logging into your MyCoyote account. The shopping sheet is available when your financial aid package is offered and when an award is revised. Elliott Guerrero offers students his best advice. “The resources that we have are all the websites available, so if you have any questions, we can answer that online. Also, try to get the FAFSA in as soon as possible. If you have any questions please come by the office and we will be able to help you out,” stated Guerrero. FAFSA filing started on Oct. 1, 2017 for the 2018-2019 academic year. It is highly recommended to file as close to October as possible to maximize the amount of funds that are available to you. Carefully managing all the requirements, documents, and deadlines is the key to success. “I’m trying to complete my FAFSA this week or hopefully by the end of the month. In the past, I normally complete my application around this time, around the end of January or beginning of February because my mom says she wants to wait until she gets her taxes done because she helps me fill it out.” says student Kiara Perez. For those with questions, the financial aid office also offers multiple workshops to provide guidance through the application process. All students are encouraged to sign up. The next scheduled dates and locations are available online and workshops run through Feb. 28. 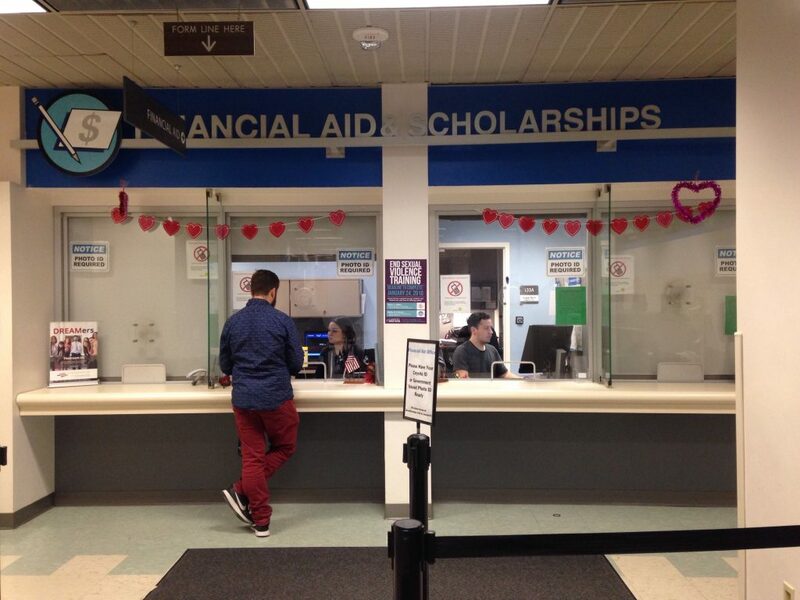 The best time to visit the financial aid office is after 4 p.m. to avoid the lines, the busiest is at noon. Visit the official FAFSA website for more information and resources. “I think the most important thing for someone to know is to make sure you do it ahead of time, make sure that you are on top of it especially with the financial aid office because a lot of the things get delayed or a lot of things get mixed up, and always make sure you are checking your account, make sure your parents information connects with yours if you are filing with them” says student, Alondra Munoz who knows all too well about the stresses of FAFSA deadlines. Regardless of all the trouble you might go through to get your application in on time it will all be worth it in the end when you are rewarded with funding to go to school. Have you filled out your FAFSA yet?